Rep. Nancy Pelosi can only afford to lose 16 votes and still win the gavel. 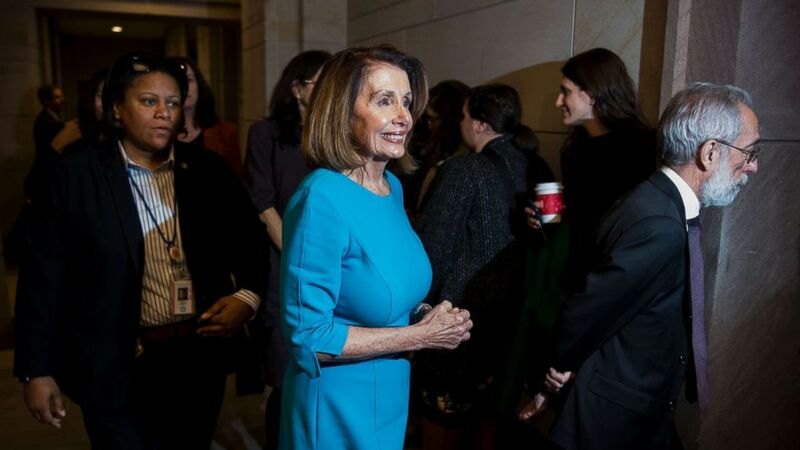 House Democrats voted to give Rep. Nancy Pelosi the official nomination for House speaker in a closed-door caucus meeting Wednesday, bringing her one step closer to winning the gavel in the next Congress. "I couldn't be more honored. That is a figure of speech, but it's about as true as any statement anyone could ever make, to be honored by the nominations of those who placed my name in nomination and the support that I have from my colleagues in this caucus," Pelosi, D-California, said following the nomination vote. "As I say, our diversity is our strength. Our unity is our power. We will use that power again." Thirty-two Democrats voted against Pelosi's nomination, while 203 voted yes, including four delegates who will not cast votes during the speaker's vote on Jan. 3. Rep. Sean Patrick Maloney, a Pelosi supporter, missed Wednesday's caucus vote but is expected to support her bid for speaker. That means Pelosi must flip at least 18 Democrats in the next six weeks in order to clinch the speakership. "Let me tell you something. I'm talking about scores of members of Congress who just gave me a vote -- giving me a vote of confidence. That is where our focus is," Pelosi told reporters who questioned the strength of her opposition following the vote. "Are there dissenters? Yes, but I expect to have a powerful vote as we go forward. Any other questions?" While she ran unopposed in the caucus, a hardened group of at least 16 critics were advocating for new leadership and calling on Pelosi to step aside. They have vowed to deny her the 218 votes she needs on the House floor, which could complicate her path in the vote. (Bill Clark/CQ Roll Call via Newscom) House Minority Leader Nancy Pelosi, leaves the CVC Auditorium during a break in the House Democrats' organizational caucus meetings, Nov. 28, 2018. With Democrats poised to hold at least 234 seats in the next Congress, Pelosi can only afford to lose 16 votes and still win the gavel. "I think we're in pretty good shape," Pelosi told ABC News when asked if she has any work ahead to capture 218 votes needed for the speakership. "Again, I don't want to speak -- I don't want to make other people's announcements for them, but we go forward with confidence and humility." The California Democrat became the first woman to serve as speaker in 2007 and is now on track to become the first speaker to win back the gavel since Rep. Sam Rayburn of Texas accomplished the same feat in 1955. Pelosi said she expects President Donald Trump to give her the same respect as speaker she received when President George W. Bush was in office. "I think that I will say this: When I was speaker and President Bush was president he treated me and the office I hold with great respect, he would jovially call me 'number 3'," Pelosi said. "We worked together on many issues and I would expect nothing less from this president." Earlier in the day, Democrats selected Rep. Hakeem Jeffries, D-New York, to serve as the party's next caucus chair over Rep. Barbara Lee, D-California, in a 123-113 vote. The results vault Jeffries, 48, to the top of the list of young Democrats who could one day succeed Pelosi, 78, and her lieutenants, 79-year-old Rep. Steny Hoyer, D-Maryland, and 78-year-old Rep. Jim Clyburn, D-South Carolina -- who both won their respective races unopposed for majority leader and majority whip. "I often say that when you think of Hakeem Jeffries and his intellectual abilities, you often think of Barack Obama," Rep. Gregory Meeks, D-New York, a Jeffries supporter, told ABC News. "If he was in the Senate, we’d be talking about him for president." After winning the fifth-ranking leadership spot over Lee, Jeffries embraced his opponent, telling Democrats that they would continue to work together in the next Congress. Lee's supporters were frustrated by the results, arguing that ageism and sexism played into the race, which they entered believing that she had the votes to win the caucus chair position. One Lee ally said the argument against her came down to "lines on a face" as much as any substantive policy disagreements. “While I didn’t win today, I hope my candidacy will inspire other women, and women of color in particular, to run for elected office and seek leadership positions," Lee noted in a statement. "Our caucus can only succeed when every voice is represented in leadership." No African-American woman has ever been elected to a senior Democratic leadership position.